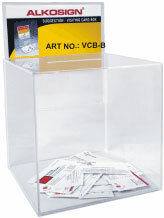 Versatile box holds suggestions comment cards,visiting cards etc. Big insertion slot on top. Big sign holder at the back. Size : 125mm X 180 mm. Can hold 100 cards easily. 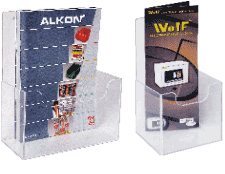 Keep on the table in exhibitions or office. A4, A5, A6, sizes in Landscape & Portrait available. Designed to fix on any wall , door, partition etc. Two predrilled holes for easy fixing. Can also be hung when used in passages or show rooms. Information easily loaded from top. For counter top or wall mount use. 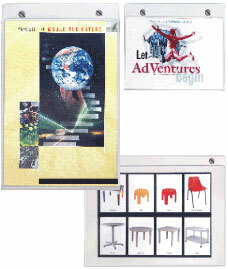 Designed for fitting on a wall or placing on counter top. 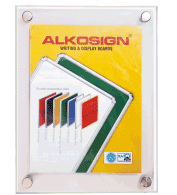 Rounded edges for smooth clean appearance. Size : Suitable for A4 size papers. Four brass nickle plated heavy screws & nuts for fixing on the wall. Openable from front for paper insertion. Four screws & plastic anchors provided for fixing on the wall.